Merbau is one of our favourite materials to work with. It works with almost any style, and we’ve used it in every type of home from heritage to the ultra-modern. This customer wanted some landscaping done for their front yard. They wanted something that was neat and eye-catching. We knew the Merbau would work perfectly with their rendered-façade, and the addition of turf would soften the look while adding to the contrast. 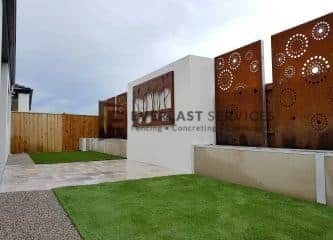 The boxes would also provide the ideal entry point to the home, giving a border for the exposed aggregate path while providing options in the future for turning them into a planter box. Our expert carpenters had to rely on all their skill to cut and fix the planks for uniformity. The slightest bow or miss-cut would have thrown off the whole design. Instead, the entire installation has been finished to perfection, every gap is the same, and every corner meets perfectly. Our landscaping team chose and laid the turf so that the owners could enjoy an immediate patch of greenery. The grass was selected for low-maintenance, it is perfect for the climate and isn’t susceptible to some of the common weeds found in the area. We also finished off the Merbau with a high-grade stain, so the wood will be weather and water-resistant and won’t require any staining for some time. The best part of this project was that we could call on our fantastic relationships with local suppliers to keep costs down. We’ve always been committed to sourcing as much as we can from the local area, and this commitment has given us the ability to source the highest-quality products at reduced prices. 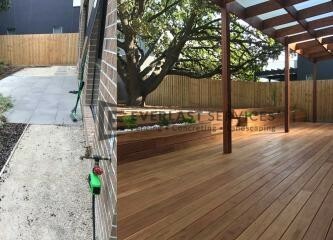 The customer was amazed at our ability to deliver an extensive Merbau timber installation at such a competitive price. Our aim has always been to provide high-quality products and services at a price that allows us to serve as much of the community as possible, and this project is proof our ability to deliver on that aim. This project is more evidence of the variety of skills we have in our team. 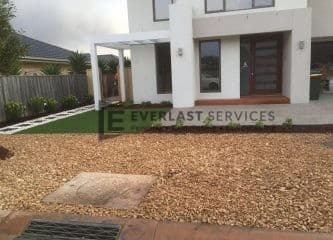 It required landscapers, concreters, fabricators and carpenters, and everyone pulled together to create something that the entire Everlast team are proud of, and the customer loves.